Hey! With the end of the year drawing near, it’s time we take a look back at the development stages the game’s gone through and the things we accomplished in 2015. This update is packed with in-depth information on the game’s development, and there’s a host of new and old images to showcase the game’s progress. We also talk about where that leads the project in terms of an updated release date. This past year and a half has been full of excitement. We released the Private Demo to the $50+ tier backers who received it very positively, giving us a confidence boost and reassurance that we’re marching in the right direction. The game’s PS4 demo was also shown at GDC, E3, Indiecade and EGS. Showing the game to such big audiences was a first for HFA, allowing us to meet with great people, share impressions and even have a few beers with some of you, our dear backers. We also launched the Backer’s Club, giving us a place to centralize all of your rewards as they become available. A small snippet of the Physical Poster, which will hopefully be printed out and shipped early next year. Next, we’ll go over a couple of important milestones the game has reached during the past year to give you some context in relation to its development cycle and the decisions we’ve arrived at. You’ll remember back in Q3/Q4 2014 we changed the game’s aspect ratio to widescreen. This meant that we had to revise/remake every room done up to that point and adapt everything to the new aspect ratio. Going into the process, we knew this was going to be a relatively lengthy affair due to the characteristics of HFA’s engine and the tools we use to develop it, but the results have definitely been worth it. During Q4-Q1 2015 we also began work on remaking the game’s introduction, which required the development of new content, enemies, rooms, cutscenes and so forth. As you might know from our original Kickstarter pitch, some of the game’s initial content was developed months or years prior to the Kickstarter campaign, back when the team consisted of only yours truly. This meant those areas of the game, developed during my spare times and supported only by my personal savings, had a humbler scope than what my vision of the game allowed. With your collective help during the Kickstarter and the successful funding of the campaign, we could no longer justify giving you anything but the best of what the game could be, so we decided to rework the game’s introduction to bring it up to par with our initial vision. The results of this remastering are very much worth it. The first chapter of the game is now more action-oriented, has a bunch of memorable imagery and is by far much more dramatic than its previous iteration. Characters have more at stake this time around, dialogue exchanges are more meaningful and cutscenes feature unique and fluid character/asset animations. There’s a very lyrical scene after Alicia falls into the valley below which I’m especially fond of. With this under our belt, we knew we had to deliver the same quality of content not only to parts of the game that hadn’t yet undergone development, but also to work-in-progress areas. Our greatest fear, after all, is to disappoint you with a final product that’s a notch below your expectations. So, a good part of this year was put to getting every section of the game evenly polished. Needless to say, I’m beyond satisfied with the outcome, as raising the bar in terms of quality puts us closer to the great games we were originally inspired by. A couple of new, central game mechanics were added. 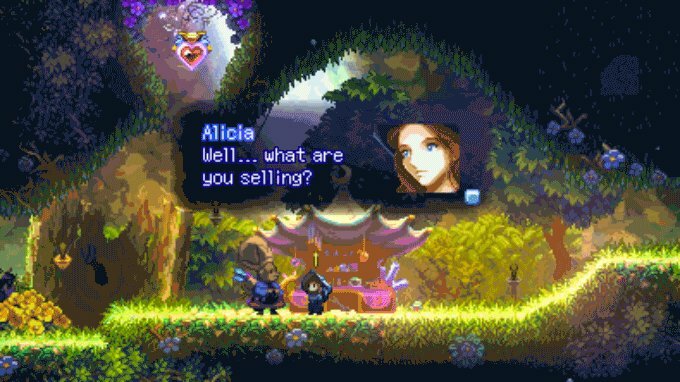 The most seemingly innocuous but meaningful one was Alicia’s ability to carry items around, which drastically changed some of the game’s design. The game’s earlier mechanics and spells were hugely improved or remade altogether, including the Wind Stone, the Quake Spell and the Ice Spirit. The Wind Stone and Ice Spirit can interact with each other in different ways, but it’s up to the player to find out how. Many new puzzle possibilities were created to support these new mechanics, and have been spread out in the game’s different environments. Earlier environments like Bottomrock, the Forest and the Desert were expanded, new rooms were made, new enemies were created for them, new puzzles were added as well as a few secrets. Cutscenes were remade, enhanced and polished to feel more dynamic and cinematic. The storyline and dialogue was vastly revised and improved. NPCs can now join your party and follow Alicia when reaching certain game nodes. This opened up a different way of telling some parts of the story. As of now there’s no benefit to having them around gameplay-wise, but we’re considering giving NPCs a way to help you in combat. The HUD and the general way of conveying crucial status information to the player was redesigned, and a bunch of feedback effects were added. The new HUD, showing multiple animations depending on Alicia’s total HP. The game’s aspect ratio was changed from 4:3 to 15:9 (to match the Nintendo 3DS’ aspect ratio). Several new particle effects were added in different situations (e.g. new charged-whip effects, improved enemy deaths, a cooler death for Alicia, splashing water, leveling up, low HP mode warnings, and other eye-candy) . The way the story is disclosed in the game generally was changed significantly to make it more engaging, exciting and concise. All the bodies of water in the game were enhanced to be rendered dynamically in Eye Candy Mode™. In other words, we’re using a very sweet shader made by Looki. The Inventory Screen was divided into two separate screens for the sake of displaying items in a more organized way, separating the loot interface from the upgrades/treasures section. New controller features were added to support practically any controller you plug into the game. You can also remap the buttons and contextual button icons will be displayed in game to assist you, whether you’re using the keyboard or controller. …The list goes on with smaller tweaks you’ll have time to appreciate in-game. The introduction segment is almost 100% done. Jonathan’s composing the final music track for this segment, but it’s otherwise virtually finished. About ~70% of the Verillion Forest is done, which is the area you enter after the intro segment’s finished, and where you’ll meet Linna and Remis, with whom you’ll travel to the Áurin Desert. When you revisit the Forest in the second half of the game, you’ll explore some rooms there that are currently in the early stages of development. About ~60% of the Áurin Desert is done. This is the main “hub” area of the game, so it’s also the biggest, most secret-filled and room-heavy. To the East, it connects to the Forest, and with Blivek City to the West. In between, there’s a few entrances to other areas we can’t reveal yet. We spoke of the Blivek Palace dungeon in a previous update, a place that Alicia enters after visiting Blivek City and where a few events crucial to the story take place. About 90% of this is done, including the music, enemies, rooms, puzzles, sounds, and three “mini boss” fights. 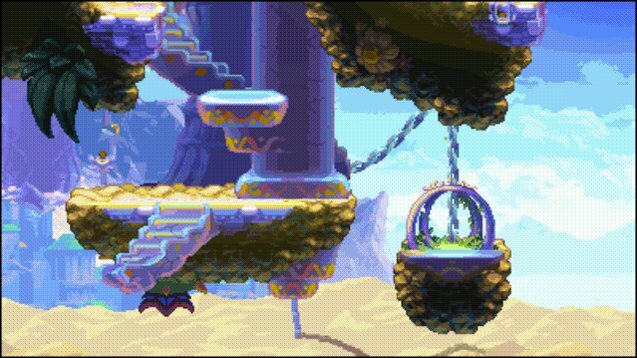 A few unique mechanics were developed for this section, including chainball switches, rising water columns, floodable rooms and special key stations that open doors in combination. We’re only missing a couple of elaborate cutscenes after the dungeon is cleared. I’m especially happy and proud with the way this dungeon is fleshed out. The City of Blivek itself is only around 20% done. Almost all graphic assets for the City, including several tilesets, decorations, building structures, etc., have already been sprited, and Jonathan will soon start composing Blivek’s themes (one for the day and another one at night-time). This is, in fact, the biggest amount of assets we’ve ever done for an environment, which is pretty exciting. Even though the core part of the city is functional, several rooms with buildings, roads, stores and so forth still need to be integrated and configured. The town still needs to be populated with NPCs, houses, side-quests, and other sweet things which, although important and extremely fun to do, are second in priority to the core path of the game and take a considerable amount of time to make. We’ll concentrate on developing this content once the main path of the game has been finished. Once we reach that stage we will also start implementing creative backer rewards. We’re already building a page in the Backer’s Club where you’ll be able to provide the information we need to bring your rewards to life. We’ll keep you updated about this and let you know once it’s up and running. Alicia and a Hooded Traveller rest at the newly designed save spot, just a few feet beneath the surface of the Áurin Desert. The Mines of Áthamynth, a dungeon you saw in the trailer and which the player was meant to enter before reaching Blivek City, has been re-purposed as a later area in the game. Because of this, we’ve slotted the Mines for an expansion that’ll add several new rooms, enemies, puzzles and a sweet mini boss battle, so the whole dungeon is about 45% done at this point. The dungeon will still be accessible to the player early on, but it’ll be pretty much impossible to survive it at that stage. In terms of areas that are yet to be developed, we still have a couple of dungeons to do (each with its own family of enemies, puzzles, environment graphics, music, a boss and a mini boss). We also have to develop the final area, the final boss battle, and in between code/sprite a bunch of cutscenes where the meat of the story is disclosed. There are other smaller details we need to add like optional areas where you’ll find some powerups, some lateral new mechanics and a few cool secrets. Alicia reaches the top of the Hill where she encounters an ominous presence. Each room is carefully hand-made, decorated and configured. Some rooms even have special graphics, elements, secrets, etc., that exist nowhere else in the game, and about 1 in every 3 rooms has a puzzle of some sort. The final room count will still vary, but we’re shooting for around 135~ for the main core of the game, plus a couple dozen more for secrets and other secondary purposes. As you might infer from everything above, we’re mostly doing content development at this point. The game’s engine is finished except for any bugs that might be discovered in later alpha stages. The pause menus, dialogue engines, cutscene routines, spells, mechanics and so forth are all done and working nicely. (Click to enlarge) Image of a whole room with a screenshot-snippet for comparison. You can also see the save spot area at the top left in the gif above. Jonathan’s about 80% done with the game’s OST which is going to end up having somewhere upwards of 50 original (and quite beautiful) tracks. Henk is almost finished making his environments for the game. Manami is almost done with her own Challenge Dungeon tracks. Looki’s also hard at work making custom development tools, helping out Mathias with the console ports and developing new sections of the Backer’s Club. Fran and Miguel continue to help out with animating enemies and NPCs. The illustrators (Lee, Cici and Gabriela) have mostly finished drawing all of the characters and background assets we’ll use for the game’s cover, Talebook, Physical Poster, wallpapers, and other marketing areas. In other words, at this point everything’s coming down to getting all those assets into the game, building more rooms, enemies, puzzles, cutscenes, secrets and other important developer-y things. Most of those tasks are my responsibility, and though I’m developing several areas simultaneously, each task requires a real-time investment, and I can only safely work for 15-16 hours a day without risking my personal health. That said, I’m happy with how everything’s steadily coming together and with making sure you get a seamless and memorable experience in the end. With all of the above mentioned, you might be wondering what the game’s release date is. Our initial / flexible prediction targeted the first quarter of 2016, but considering all the pieces that still need to come together for the game’s release, we have re-calibrated our target past that timeframe. Our current target for a near-finished state points towards the second half of 2016. As you might imagine, scheduling a release is always tricky because the development finish-line are known to move as you approach them, so we can’t give you a more precise window quite yet. We will nonetheless keep you informed as we get closer to the final stages of development. Your generosity has given us an opportunity not many indie game developers get, so our first priority is to release an experience that will be memorable and worth your wait. Unlike as within the game itself, we won’t get a second chance to get things right, so we’re striving to produce something that we’re satisfied with and are proud of. We absolutely understand that delays might lead to disappointment over not being able to play the game earlier, but it’s worth remembering that every change the game has gone through, from its humble scope of the pre-Kickstarter days up to this day, has been to make sure the final game’s quality remains uncompromised. In this pursuit, we are grateful for your patience. Throughout the past year and a half we’ve been doing livestreams, but not on a regular basis. For a little over two months now we’ve been doing weekly livestreams, and we’ve decided to continue these throughout HFA’s development, so feel free to come join us, stay in the loop, see what’s happening behind the scenes and get answers to any questions you might have about the game (or anything else for the matter!). The streams mostly go live on Friday evenings. The exact time of day depends on the workload, but we tend go live between 3 to 5pm CST. Our Twitter followers usually get a notification ahead of time. These livestreams are always centered on HFA content, whether it be spriting enemies, NPCS, coding them or whatever other task is at hand. The atmosphere’s light and friendly, so feel free to drop by and hang out in the chat. That’s pretty much it for this update. Thanks for sticking around and reading up till this point. We value your time, so we hope this lengthy exposé shed some light on our activities since the end of the campaign and our future plans. Let us know if you have any questions or comments. As always, thanks so much for your support. Lastly, in case you celebrate Thanksgiving, we hope you had a wonderful time with your loved ones last week! definitely gotta agree with Ignacio on this one. to have a game developed and spent countless hours tweaking it to be a quality title. I must say I can certainly have patience for it as the future draws near. It’s been a long journey and I’m certainly having my fill of other activities to tide me over and keep my expectations from becoming unrealistic or impacting. because I can genuinely say that I enjoy the Metroidvania genre as it offers many aspects of various genres in a unique package. Absence makes the Heart grow fonder. :3 Keep up the stellar work! then we can have a wonderful title brought Forth. It seems like the gameplay and and overall atmosphere is already top notch. But I just recently have started watching anime and realized how important in these kind of games is characters and some long, atmospheric conversations, and that the best games I remember are always the ones with a lot of dialogue or slow lingering moments. Characters and unique moments are what stick to people’s minds, they are the things they are then remembering. My fear is that even if the game would be excellent gameplay and storywise, dialogue would be left too cold and shallow. So if there isn’t much of this kind of content, do it. I don’t mean that the game would need to be dialogue heavy. There could be just a few long converstations associated with some of the bigger moments of the game, that make you feel refreshing, “a new start” kind of feeling. I can already imagine how an average gamer’s experations are blown through the roof after the first time something major happens in the game an they are like “wow, this game is much deeper than I even first realized”. And then they can’t stop playing it. The argument of heavy dialogue vs. minimal dialogue is a very subjective one. My all-time favorite games (Dark Souls, Shadow of the Colossus, Super Metroid) take a very minimal approach to dialogue, and instead rely on mood, setting, and gameplay to communicate the story. I don’t think this approach to storytelling takes away any sort of connection to characters you may have or how strongly you remember character interactions (in my opinion it enhances those things). For example, when Samus takes her helmet off at the end of Metroid, or in Shadow of the Colossus when your horse, Agro [SPOILER REDACTED], or throughout Dark Souls where many of the NPCs you meet tragically become hollow. Even though these are some of my favorite moments in gaming, I don’t think that every game should take the same approach. If the game is designed in such a way that it calls for heavy dialogue, then so be it. It’s ultimately up to the artist. @Someone Thanks for sharing your thoughts! I’ve actually had a lot of headaches over how long dialogue should be in a game like this, namely because some niche gamers would rather have a game without any dialogue at all (like Super Metroid). Truth be told, you can indeed tell stories through level design, but there’s really only so much depth you can achieve, and in a world with more than one human, you can only justify as stylization when they never utter a word to each other. I’ve tried to balance showing *AND* telling (instead of only the former, which is the general mantra). In other words, sometimes the story is told through action, sometimes through dialogue/diegesis. Concretely speaking about dialogue in HFA, I’ve tried making it as efficient as I reasonably can. Every line has some purpose or another: either it discloses new information, tersely elaborates on something, discloses subtext, foreshadows or tries to make you laugh/feel bad/etc. Years ago I was very generous with dialogue and it dragged the game down, then I went to the other extreme and cut it out as much as possible to the point where some things feel a bit boney. At this point I think I’m still on the more terse side of things, but it boosts my confidence to know other people would prefer to have a little bit more information to go on. I plan to go back after main testing and add a few extra lines where needed. I hate info-dumping. I have no idea why writers are not called on it more often. It so artificially speaks to the reader, it always makes my eyes roll. Characters in this game instead talk like real people. E.g. if characters are familiar with places, things, etc., those are only referred to as “it”, “that”, and so on. Things are only explained if one or more characters are themselves not familiar with it. This means that sometimes you have to work a little to figure out what’s being talked about, and a few extra lines might help make the general conversation more clear. Anyway, thanks for giving me something to chew! Following up from Twitter, I think part of the answer could be in Lore. Metroid Prime has a lot of lore for everyone who wants to learn about the world, though there’s no dialog in it to even get people interested. Rogue Legacy had that too with the extra rooms. Once you realize what they were you could just walk out if you didn’t care. Shante and the Pirate’s Curse has a reasonable amount of dialog, even if it’s mostly at the beginning and end of levels. That said, I hate the idea of lore in books where the lore is a almost literally a novel. In a less related way, I wonder if a bulletin board couldn’t work to provide the context the characters living in the world already have because announcements have to be specific. I seem to recall Deus Ex doing something like that, though I never read it because, well, sneaking is more fun. Regarding the Extra Credit’s video about game writing pitfalls, for a Metroidvania, it would be really nice if you could use the travel time between places to have that world building dialog, but I think that requires voice overs sadly, because otherwise you can’t guarantee the player will see it. That said, it’s important to make the distinction that games like Metroid or SOTN are NOT story-driven. They have virtually no story; only a straightforward, generic one. Those games aren’t about story, they’re about gameplay, mechanics, exploration, etc. There are certainly details in level design/etc. that reveal a story of what happened in that place before you arrived, but that falls more into world-building than actually narrating a character arch. Samus’ character never transforms or grows (up till Other M) , neither does Alucard, etc. And I’m not talking about getting more weapons & becoming more powerful; that can be argued to be a story, but not the kind I’m talking about. In other words, things stay simple throughout. Which isn’t a problem. The problem is, in my view, that some people inadvertently bundle “story-less” games with story-driven games, arguing that the former does a much better job at telling a story through means other than words, which is argued to be precisely the great blunder of the latter. And I think it’s the genre—metroidvanias—that has become so defined by a lack of story that a sort of purism has evolved, making it hard for people to open up to bringing elements from other genres into this one. Hello Alonso, dont know if you’re Mexican, I’m just hearing about this game, I’m amazed and I would tell you why. games that have marked my life are, Final Fantasy 6 and 7, Legend of Legaia, mario rpg, among others, however one of the strongest that came into my life was Xenogears, beautiful story, graphics, the battle sistem above all, i really have not read much about your game, because as I say, just find out about it, however i read that is being developed in México and is based on Xenogears, I always wanted to find another game like that, even tried to create a game like this, but I’m not expert at it, so I am very grateful to you for doing this, I would love that you to write me to my email, I would feel I honored, do not worry, I’m not a crazy fan or a stalker, I just like to know that I am close to someone who will save the old RPG games. finally after this huge text, I leave you, asking you that please dont let this be the last thing you do in videogames, and remember, turn-based battles do not have to go out of style, regardless of new technologies, it is something that a lot of people like. Hola Alonso, no se si seas mexicano, apenas me estoy enterando de este juego, estoy maravillado y quisiera contarte por que. de los juegos que mas han marcado mi vida son, Final fantasy 6 y 7, legend of legaia, mario rpg, entre otros, sin embargo uno de los que mas fuerte entro en mi vida fue Xenogears, la historia, los graficos, pero sobre todo las batallas, realmente no he leido mucho sobre tu juego, ya que como te digo, apenas me entero de el, sin embargo lei que esta siendo desarrollado en mexico y que esta basado en Xenogears, siempre quise encontrar otro juego asi, incluso busque como crear un juego asi, pero no soy experto en ello, por lo que te agradezco enormemente que tu lo hagas, me encantaria que me escribieras a mi correo, me sentiria honrado, no te preocupes, no soy un fan alocado o un acosador, simplemente me gustaria poder saberme cercano a alguien que va a salvar lo que extraño de los juegos RPG. en fin despues de este choro enorme, te dejo, pidiendote que esto no sea lo ultimo que hagas en videjouegos, y recuerda, las batallas por turnos no tienen por que pasar de moda, sin importar las nuevas tecnologias, es algo que nos gusta a muchos. So its July, 2nd quarter is quite past us. Updates? it is August 10th now. Is everything okay? we are in third quarter heading for fourth. I would appreciate an update. I am not mad or anything. I would just like some updated info please and thank you. We’ve been regularly updating HFA’s Kickstarter page, but due to the way I built this website, it makes bringing those updates here very laborious because of formatting issues. Sorry we’ve fallen back over here. Feel free to head over there to read what’s happened since this last update. There’s lots of gifs and info. We’re planning to release a new version of this website at some point so it’s easier to keep things updated on all fronts. Thanks for keeping an eye on our site!